The American Studies Association (Philadelphia, October 11-14) organized a session called Democratic Vistas: How Can American Studies Scholars Engage with Public Policy. Here is a summary of the talks. 1. Nicolas Bromell, University of Massachusetts, Amherst and The History Democracy Project. The right has its think tanks, which serve as direct channels for conveying scholarly ideas to policy makers. You all know these think tanks; they are constantly in the news. The think tanks on the left are less effective and hardly known. Nick wrote to John Podesta, President and Chief Executive Officer of the Center for American Progress and former Chief of Staff to President Clinton, who said that no academics were doing much of policy relevance on the left; the right is able to draw on its scholars but the left is not. (a) While left-oriented scholarship has been successful in transforming the intellectual view of the USA, it has been presented only to other scholars and students. No attempt has been made to give it a policy handle that policy people could grab hold of. One thing that progressive scholars could do is ask the question "what are the policy implications of this work?" (b) The left has been thrown off base by the onslaught from the right during the last decade. Nick then described the History Democracy Project. This project grew out of a conference at the Organizagtion of American Historians in 2006. The project has started with "baby steps": a conference scheduled for January on history and policy, bringing together historians and policy people focused on foreign policy, and another one planned for the future on immigration policy. The right flourishes because of money, funding from the government, from private foundations. The democratic party has been in the hands of neo-liberals; few democratic policy makers have any interest in the left's point of view. Progressive knowledge production has also been inefficient; many topics are studied, few are politically hot at the moment. The question is how to parley scholarship into a current policy conversation. Mae used her own work to illustrate this problem. She is an historian of immigration to America through 1960. Even to start being able to make her scholarship public, she had to teach herself about current immigration policy. Her point was that even those in the most relevant scholarly fields still have a lot of extra homework to do just to be able to talk about current matters. (b) Talks to policy groups. She spoke at a symposium on guest-workers sponsored by the Farm Workers; many congressional staffers were invited but none came. However, more than 50 people from inside-the-beltway NGOs showed up. Her takeaway from this was that it was naive on her part to imagine herself speaking directly to policy makers, but it was possible to speak to lobbyists for NGOs that do speak to policy makers. (c) Op-ed articles for the press. Being a historian gives you a good angle for writing op-ed pieces. Editors want a usable past. But editors also want ideas that are not too radical. History can help generate the right sorts of ideas. For example, with all the hysteria about amnesty for illegal immigrants, a historian can say "we used to do things like that, it didn't work out so badly, its not off of the national bandwidth." Still, it is not easy to get op-ed pieces placed. Her university press office has been helpful. Her agent helped her place an op-ed in the LA Times. She's also had articles in The Nation. Demos was founded in 2000 in response to Bush v. Gore. Its first issue was naturally election reform. Then it took up the issue of expanding economic opportunity: how people can get into and stay in the middle class. Demos then took up the issue of the loss of faith in "public knowledge" -- the distrust in government, in regulation, in taxation. So the question was "how can we change the anti-government image that neo-liberal groups have instilled in the public? In addressing this Demos has partnered with other advocacy groups. mentioned the story lines about "bickering politians" and about "wasting government money". Such narratives give publics pegs upon which to hang current news events. The current consumer orientation of citizens, the question "what's in it for me?" places civic argument on the wrong track. Even public advocates fall into this trap, employing arguments of the form "this is good for you because . . ." But whenever progressives buy into this story line they lose, because the story further entrenches the idea of individualism as opposed to solidarity in the public interest. Progressive scholars have to study and come to understand how this kind of consumer citizenship thinking arose. And they need to look at alternative cultural story lines that have actually brought people into the public as citizens not consumers. In thinking about this Patrick has been assisted by the work of former labor secretary Robert Reich. Comparing two generic story lines, "the benevolent community" and "triumph of the individual" we need to find and build narratives based on the former. This will take conscious activity, identifying current topics where scholars know the history and can convincingly create such narratives. The John Dewey Society, through the Commission for Social Issues and in other ways, can make common cause with organizations like the History and Democracy Project and Demos. And it can also partner with other scholarly societies like the American Studies Association in keeping questions about scholarly contributions to the public alive in the academy. NCLB has entered its fifth year, the year that its draconian sanctions are scheduled to take effect. But almost all of the schools serving poor children in the nation's largest cities are still failing. The schools are now scheduled for closure or other drastic remedies. But nothing seems to be happening. So far, education experts say they are unaware of a single state that has taken over a failing school in response to the law. Instead, most allow school districts to seek other ways to improve. As a result, the law is branding numerous schools as failing, but not producing radical change — leaving angry parents demanding redress. California citizens’ groups have sued the state and federal government for failing to deliver on the law’s promises. Schools are struggling with students who bring their iPods to school. But some schools are joining the iPod generation rather than fighting it. These schools are employing iPods as tools to increase bi-lingual abilities and as adjuncts to lessons in just about all subjects. The schools purchase iPods in bulk and load them with video and audio lessons. Some buy the devices for all students; others buy enough to hand out in classes. 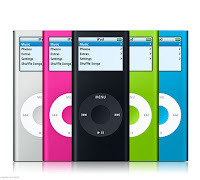 Some are finally allowing or even encouraging students to bring their own iPods to school, so that the lesson files can be loaded. In one recent class at Jose Marti school in New Jersey, Spanish speaking eighth-grade students mouthed the words to the English language rock song “Hey There Delilah” by the Plain White T’s as they played the tune on the iPods over and over again. The braver ones sang out loud. Grace Poli, a media specialist at Jose Marti, said her Spanish-speaking students — known around the school as Pod People — have been able to move out of bilingual classes after just a year of using the digital devices, compared with an average of four to six years for most bilingual students. "Fifty years ago today, a San Francisco Municipal Court judge ruled that Allen Ginsberg's Beat-era poem "Howl" was not obscene. Yet today, a New York public broadcasting station decided not to air the poem, fearing that the Federal Communications Commission will find it indecent and crush the network with crippling fines." Japan is revising its school social studies textbooks to cover up mass murders and suicides of Okinawans imposed by the Japanese military before the American invasion of Okinawa in 1945. The Okinawan protests against this cover-up have rocked the new government. Federation of Teachers, might be of interest. 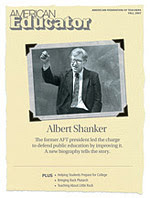 It includes a book excerpt from Richard Kahlenberg's new biography of former AFT president, Albert Shanker, as well as articles on the Little Rock Nine, and the importance of teaching Plutarch in high school humanities classes. The Primary Task of Social Issues is to encourage scholars and educators to communicate with concerned publics about social, cultural and educational issues, and to assist them in so doing. OK. How do you do that?? 1. Decide how you’re measuring success before writing a post—what’s your metric? Form follows function. Decide on your first or last sentence/question/scene, then fill in the rest. If you can’t decide on the lead, start with the close and work backwards. Frederick H. Burkhardt, a pragmatist philosopher who served as the general editor of the collected works of William James and co-editor of The Correspondance of Charles Darwin, died in September at the age of 95, the New York Times noted today. 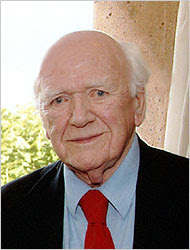 Burkhardt, one of the most distinguished of American scholars, was professor of philosophy at the University of Wisconsin, and later served as president of Bennington College. When he became head of the American Council of Learned Societies in 1947 the council was struggling. Under his leadership (he reitred in 1974) it became an important coordinating agency for learned societies, Burkhardt was also influential in founding the National Endowment for the Humanities. "Bud the Teacher" is a wonderful and widely viewed education blog. Many teacher blogs link to it, so "Bud" is able to influence a lot of people. I'm in the memory business, and each time a person dies, it's a whole library of memories that leave. Bud adds: I hope we're all just a little bit in the memory business. All scholars and teachers are in the memory business -- research of all sorts is our link to collective memory and teaching is our way of bringing it to conscious awareness. Progressive scholars contribute to that awareness through memory-gathering research and teaching, but also through communications in the public media and, like Bud, through blogs. Diance Ravitch has an op-ed article in the New York Times today urging major overhaul of NCLB. Her proposal is first, to abandon the silly rhetorical goal of 100% proficiency, and second, to abandon the flawed state level tests. In place of the tests she proposes that the federal government collect all statistical data, in line with the national assessment of educational progress or NAEP, and then support the states in providing local solutions for the specific problems the tests reveal. Ravitch's article can be a good jumping off platform for further thoughts on NCLB. Please consider offering a comment about it. The Commission on Social Issues is a committee of the John Dewey Society. John Dewey (October 20, 1859 – June 1, 1952) was an American philosopher, psychologist, and educational reformer, whose thoughts and ideas have been greatly influential in the United States and around the world. He was one of the founders of philosophical Pragmatism, and the father of functional psychology. He was also the leader of the progressive movement in U.S. schooling, and his thought continues to inspire educators and influence contemporary educational projects. Founded in 1935, the John Dewey Society exists to keep alive John Dewey's commitment to the use of critical and reflective intelligence in the search for solutions to crucial problems in education and culture. The Society subscribes to no doctrine, but in the spirit of Dewey, welcomes controversy, respects dissent, and encourages the responsible discussions of issues of special concern to educators. The society also promotes open-minded, critical reconsiderations of Dewey's influential ideas about democracy, education, and philosophy. The Commission on Social Issues exists to encourage and support communications among members of the John Dewey Society and concerned publics on current social, cultural and educational issues. The web log 'Social Issues' is one avenue of communication for members of the Commission for Social Issues and the John Dewey Society. Members of the John Dewey Society are encouraged to join the Social Issues team.